Picture this – early summer evening in a busy campsite, it’s the height of the disco era (I’m a 70s kid) and a group of professional roller-skaters are rehearsing the show they will perform later at the local night-club. The kids have gathered around the makeshift platform and are admiring the skaters’ daring jumps and dancing moves. As a bit of fun the skaters ask the kids if they want to have a go and one by one the kids take their turn being twirled around with much squealing and delights. Except me, they ask me once, twice, three times and every time I decline. I’m scared I might hurt myself, not be able to do what they ask, and even though I’d love to do it I don’t believe I have what it takes. After a while the rollerskaters packed up and left, I missed my opportunity to try something new, test my abilities and grow. My 6 year-old-self vows never to let that happen again. Fast forward 30 years, no disco ball but a corporate meeting room and it’s performance review time, as a manager I usually have 3 scenarios: for some people I really look forward to do the review, for some it’s a tick in the HR box (sorry, their lack of enthusiasm is infectious) and for some I don’t look forward to it … at all. Why do I look forward to it with certain individuals and not others? Because like the roller-skating kids at the campsite they see the review as an opportunity to grab with both hands and they have the desire to make the most of it. In other words we’re going to have a constructive and energising conversation that will challenge both of us. I know that during our time together learnings will come out, ideas will spark and action plans will be put in place. And thanks to Pr Carol Dweck, there is a name for such behaviour: these individuals have a growth mindset. I won’t expand on Dweck’s concept, she’s done it in her book and there are plenty of articles on the subject. I will offer two reality checks and 4 ways you can foster a growth mindset based on my experience as a leader and a coach. Reality check #1 – no-one is entirely one or the other. We swing from growth to fixed mindset throughout the day and that’s fine. The key is to be aware of it and foster a growth mindset through our way of working. Reality check #2 – let’s not kid ourselves, being open-minded or liking the latest technical gizmo doesn’t magically deliver a growth mindset, if you don’t take any action towards the challenging new ideas your mindset is very much fixed I’m afraid! Socially it’s not always seen as a good thing as curiosity gets mixed up with prying but a healthy dose of curiosity is the foundation of a growth mindset (and leadership). Be curious of yourself and of others. Ask questions, why, how, what’s next…Look beyond your industry, in this networking age connect with people in a totally different industry. Look up, look sideways, never stop looking! As I mentioned earlier you’re unlikely to keep up a growth mindset 24/7, what’s more important is to identify your “triggers”: what puts in a fixed mindset? Then you know what to work on in order to develop more of a growth mindset. Becoming more self-aware (I know I keep going on about this but honestly self-awareness is a fast-track to a strong leadership, see my article) will help you identify your triggers: observe your reactions under certain circumstances or get feedback for example. Alone you will only go so far, others will bring perspectives and ideas that together you can make bigger and better. 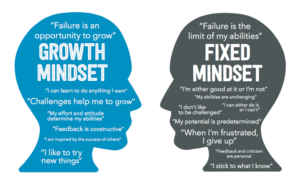 The fundamental belief when you have a growth mindset is that nothing is set in stone and you can develop talents, skills and change your behaviour. It’s a lot easier to achieve if you are surrounded by the right people and value collaboration. I never got spun around on roller-skates however, beside my undying love for disco music, I try and foster a growth mindset: I don’t shy away from opportunities to learn however scared I am and I’ve succeeded and failed enough times to know that nothing is final. 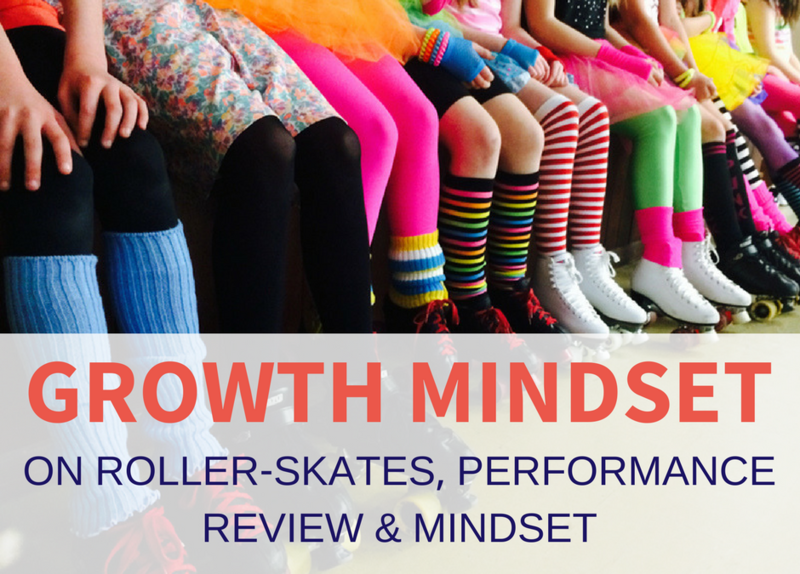 Over to you, how do you foster a growth mindset?